Customization options that let you select any color. Unlimited Tabbed browsing and Dual panel in landscape mode with Drag and Drop between panels functionality. Create Tasks with Copy, Move, Paste operations. 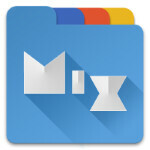 Various View Modes and Sorting Options for each folder. Export/Import all preferences, bookmarks, and customized skins. Opening zip files in network storage. Integrated with 19 cloud storage providers, in addition to clouds with webdav support like Yandex.ru, OwnCloud, 4Shared, MyDrive.ch, DriveHQ, CloudMe, CloudSafe. Root access for advanced operations. Built-in Image Viewer (with GIF animation support). Woah! That was a whole lot to wade through, and there's more where that came from! To sum up, if you are in need of a one-stop-shop file explorer that isn't Root Browser, go ahead - visit the XDA Developer board (use the developer or download links below) and treat yourself to the free .apk! No, you won't find MiXplorer in Google Play for some reason, but how complicated is a manual .apk install anyway? well, I'll take the "far away" part out. this app is moving to the right direction, looking forward to see more of it. Mmmh, quite happy with "ES File Explorer" ..but will check it out! yup Es File manager is simply the best casue of icon grid view..... and the ability to customize the viewer to match your style. why don't other devs get it, file explorers are better with icon grid , cause it's the way desktops work. It also has some great NAS features , works great for wireless sharing. Yeah, the only thing I would love to have on ES FE is the dual windows with drag n' drop... it is something that my 9 YEARS OLD! Archos DVR had... and I loved that... ES is still very good for moving files around, by creating multiple windows and you can drag n' drop between them, but not on the same screen. Anyway I don't thing I will replace ES, I use the SD Card Analyst a lot... this one doesn't seem to have it. Too bad it comes with Baidu spyware, just google it. Should have included an optional dark theme in the apk package. To use a dark theme, one will now have to either make one with the included creator or download one manually online. IMHO, it's not well thought on, inclusion of a dark one will cater for most people's need, otherwise it's a pretty nice alternative to my preferred x-plore. I use it. Has replaced my ES file Explorer. IT does everything that ES does, only neatly. Great! Need to check it. ES File Explorer is the best - even with 0 app on your phone/tablet you can use ES for light web browsing, music play, image view and basic editing, zip/unzip task. Install uninstall apps and things....a lot of things. Wait, the app is good. But you need to install each and every skin you want? It doesn't have recycle bin. I've never had a need for recycle bin on phones but it'll surely be handy. Using Solid Explorer Alpha which has everything I want (and more) including a nice MD interface. So not switching here. Same here. Using Alpha. Love it. FX File Explorer is better, a lot more material design, is free and also no ads. The only thing they sell is something called networks tools which is the cloud service access plus a couple of actual network access tools, if this is so important i think 2.99 it's not the much. I feel FX even better tha ES. Me too. I prefer FX to this app.